This actually comes from a friend of mine and not me. So you know it's good. She says it tastes great on basically everything. 1) In a bowl, combine onions, 3 tsp of the vinegar, and 1/2 tsp of the salt. Let sit for 30 minutes. 2) Rinse the onions lightly, then drain and pat them dry. 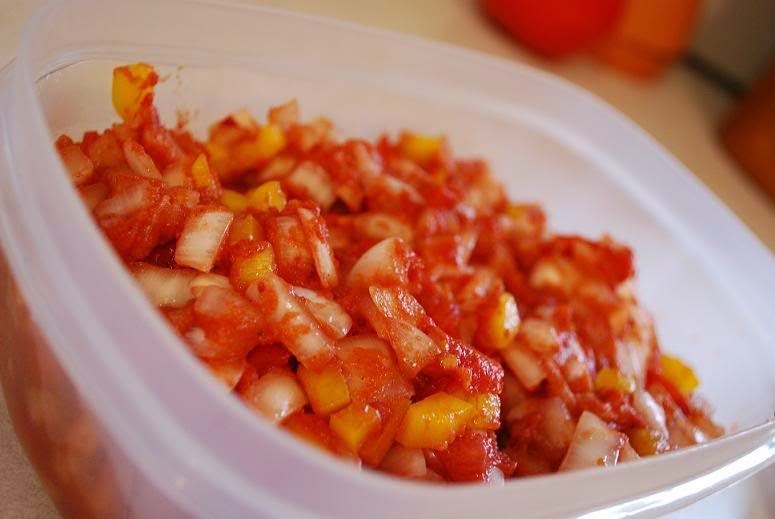 3) In a bowl, combine onions, remaining 1 tsp of vinegar, bell pepper, tomato, tomato paste, vegetable oil, garam masala, cayenne pepper, and the remaining 1/2 tsp salt and mix well. Add garam masala, pepper, and salt as needed to taste. If you like it mild, stick to the given amounts. I ended up added a bunch more to make it nice and spicy. Generally, the chutney will be better after it sits for a while to let the flavors meld together.